The demonstration flight of America’s new astronaut capsule will see it attempt to dock with the International Space Station (ISS). 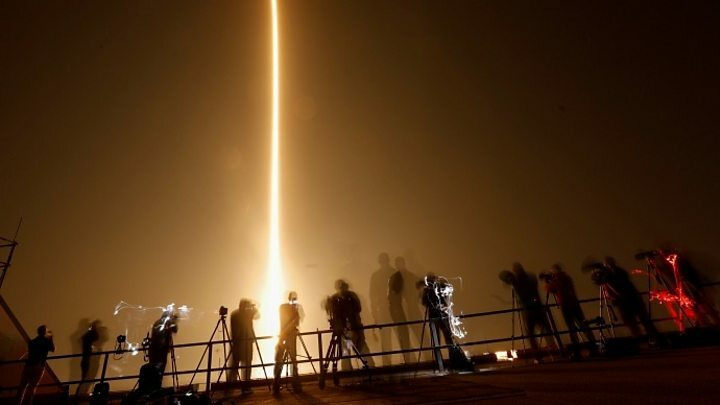 The Dragon vehicle, launched by California’s SpaceX company on Saturday, is designed to make the attachment autonomously. It is the latest in a series of tests the capsule must pass in order to get approval from Nasa to transport people. All this particular mission is carrying is a test dummy and 90kg of supplies. The docking should occur at about 11:00 GMT. The Dragon will approach the 400km-high station from the front and use its computers and sensors to guide itself in. Astronauts aboard the ISS will be watching closely on HD cameras to make sure the capsule performs as it should, and be ready to intervene if it does not. The procedure is a step up for SpaceX because the cargo ships it normally sends to the lab have to be grappled by a robotic arm and pulled into a berthing position. The freighters do not have the sophistication to dock themselves. The Dragon capsule is due to stay at the ISS until Friday when it will detach and begin the journey back to Earth. This is the phase of the mission that SpaceX founder Elon Musk says worries him the most – the fiery, high-speed descent through the atmosphere. The Dragon’s backshell, or heatshield, has a somewhat irregular shape and that could lead to temperature variations across the base of the capsule at hypersonic speeds. “It should be fine, but that’ll be a thing to make sure it works on re-entry,” said Mr Musk. The American space agency wants to contract out crew transport to SpaceX. Agency officials still check off every step, but the approach is regarded as more efficient. Nasa chief Jim Bridenstine said it was a new era where “we are looking forward to be being one customer, as an agency and as a country. Next articleSupply Chain Graphic of Week: The Disappearing Middle Class?